I learned how to make easy chili recipes for those who do not have a lot of time to cook. Many “chili zealots” claim you cannot produce a quality pot of chili without hours of cooking time. Personally, I have tasted others and I have learned to make easy chili recipes that were really good. These recipes were easy and quickly thrown together. By using canned products and good spices a flavorful product can be achieved in a short time. I believe the following old recipes that I have used may have come from Campbells Soup but I am not sure. You can learn how to make easy chili recipes by using these. The first one is very versatile by substituting different ingredients to suit your taste. In a large heavy Dutch oven or kettle, cook the meat, onion, green bell pepper and garlic until meat is brown. Stir in the soup, vegetable and its liquid, chili powder, and cumin. Heat mixture to a boil and then reduce heat to lowest setting. Simmer uncovered for 30 minutes, stirring occasionally. Ladle into bowls, garnish and serve. 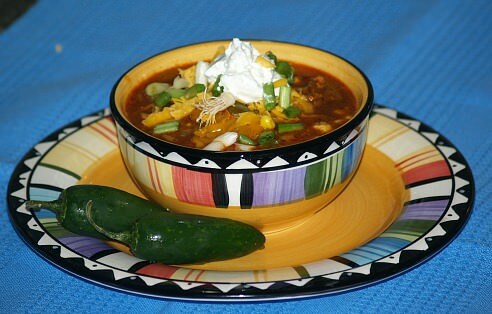 The next quick chili recipe also uses Campbells Soup . It is also a very simple recipe to put together and has great flavor. In a large heavy pot brown the beef, onion and garlic. Add kidney beans, tomatoes, soup, water, chili powder, cumin, pepper and bay leaf. Bring to a boil. Reduce heat to low and simmer for 15 minutes to blend flavors. Stir occasionally. Remove bay leaf and ladle into bowls. Garnish with cheese or sour cream. Brown beef in skillet; add onion flakes, salt and pepper. Place mixture in crockpot and add chopped steak to pot; add tomatoes, tomato juice and beans. Stir together and add chlli powder; cook on high 3 ½ to 4 hours. Add dry spaghetti and cook 1 more hour. 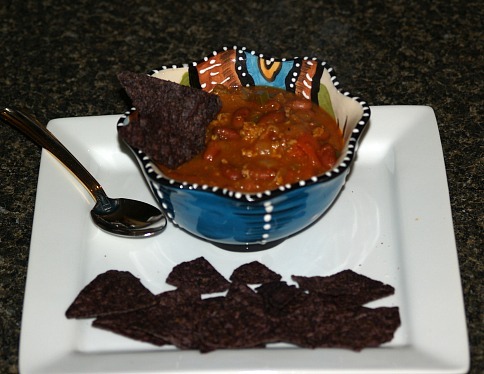 This is one of the easy chili made with venison. Many people love cooking deer meat and the spices used in chili goes well with the meat. Cover dry pinto beans with water; bring to a boil and cook about 1 hour. Brown venison in large skillet; add onion and garlic and cook until onion is tender. Add meat, tomatoes, tomato juice and seasoning to pinto beans. Return to boil, reduce heat and simmer on low for 3 to 4 hours or until beans are very tender.